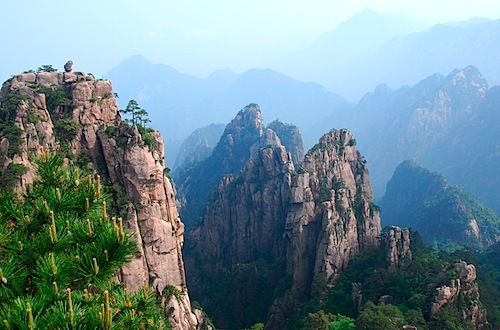 Northern China’s answer to Huangshan is Taishan, one of China’s 5 most famous mountains. 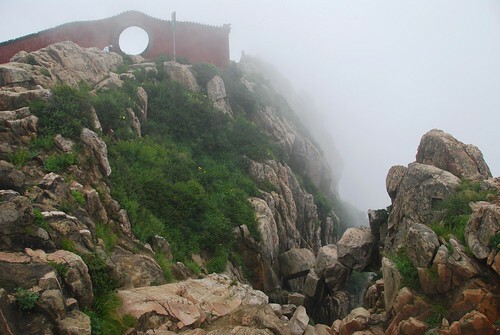 Tons of famous Chinese people—including Mao Ze Dong and Confucius—have summited this holy Taoist mountain, which, frankly, is no small feat, given that the central route up Taishan is pretty much a sweaty Stairmaster workout of 6,660 steps. It is said that if you make it to the top, you will live to 100 years. Not a bad deal, in our opinion. 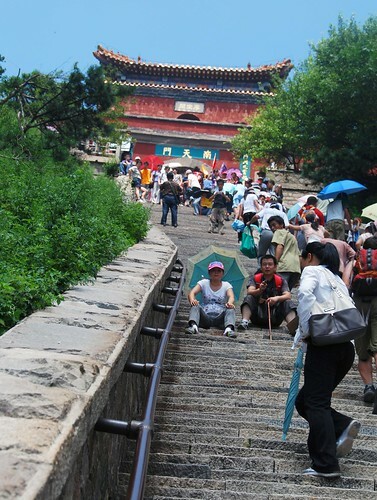 The path to the top of Taishan. 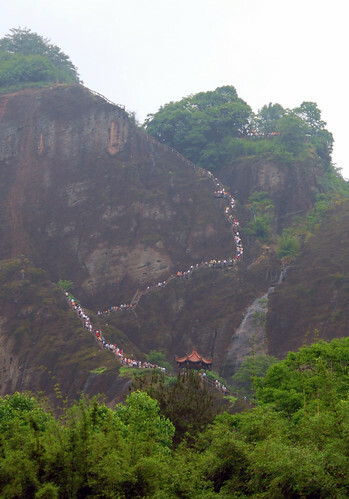 The promise of long life has proven to be enough to get hordes of Chinese people up this mountain, even if they hike it high heels, skinny jeans, or heck, even their underwear. Only in China: Underwear Man hiking Taishan in his manties. Funny thing is, Underwear Man attracted less attention than Jeremy, who I swear must have been the only wai guo ren on the mountain that day. On top of that, Jeremy took off his shirt (hey, it was hot! ), and I don’t know if it was the hairy chest or the shirtlessness or his massive pectorals (Ed note: Jeremy made me write that) that had all the Chinese people picking their jaws up off the ground. 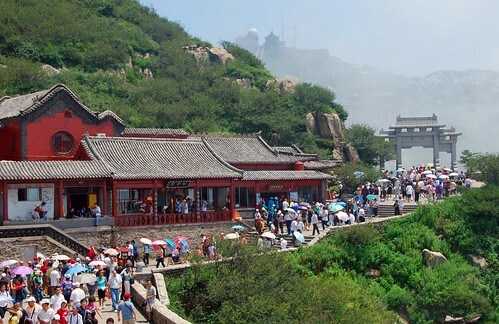 Taishan is very similar to Huangshan in that the sunrise and the cloud ocean are the main attractions. We didn’t see the sunrise this time—staying on the mountain on the mountain is expensive—but we did get enveloped by those famous clouds when we reached the top. The summit of Taishan enveloped by that famous cloud ocean. 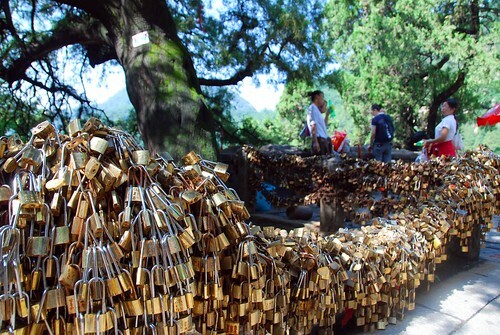 As in Huangshan, people hiking this mountain also superstitiously place locks on the chain link fences as an insurance policy for their marriage. Judging from the amount of locks we saw, it looks like more people hike Taishan than Huangshan, or there are just more suckers in Taishan. Locks galore on Taishan’s fences. 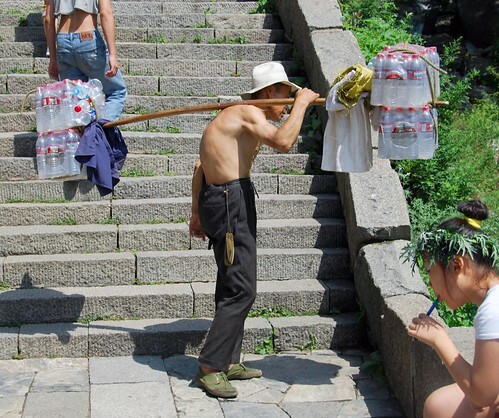 Also similar to Huangshan, there are bang bang men hiking up the mountain with bottled water, their repeated trips up and down the mountain permanently warping their skeletons into painful-looking shapes. Yet another reason why plastic bottles are bad for humanity. 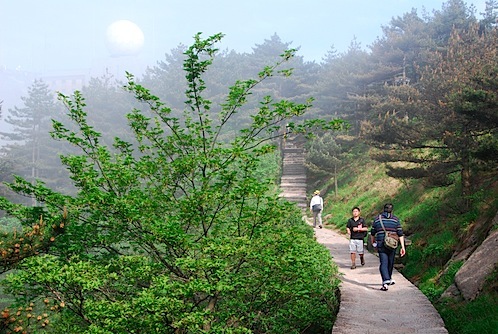 Hiking Taishan is a fine way to spend the day, though we prefer Huangshan to its norther counterpart. One route up means the stairway becomes very crowded, and given that you can also reach the top via a bus/cable car combo, the summit is swamped with domestic tourists who are still hoping to get their 100 years without breaking a sweat. The hordes at the top of Taishan. It took us four hours to hike to the top of the mountain, and a quick 15 minutes to get back down the mountain using the cable car and bus option. Not bad for an extra 60+ years on this extraordinary planet, eh? Where we slept in Taishan: Actually, we slept in Tai’An, because staying on the mountain was a little too spendy for our budget. No matter, Taishan is easily done as a day trip, though if you want to see the sunrise, you’ll need to spend the dough…or hike through the night (survey says: NO). We booked Dongdu Hotel via ctrip.com for 168 RMB (for a double with bathroom ensuite). Not a bad deal for a three-star hotel. Rooms have little character, but they are spacious, reasonably clean, and some have views of the mountain. Plus, each room has free plug-in internet access and a water cooler dispensing drinking water (a nice touch in China!). Qingdao is a former German settlement in Eastern China known for its beach and its beer (which you may know by its Wade-Giles spelling, Tsingtao). It rained pretty heavily while we were there, but honestly, we didn’t care. As long as the the mercury didn’t climb above 90°, we were happy campers. 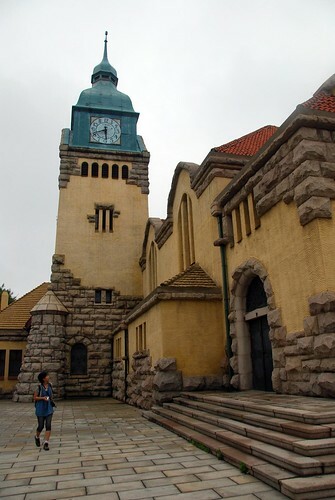 The Protestant Church in Qingdao. 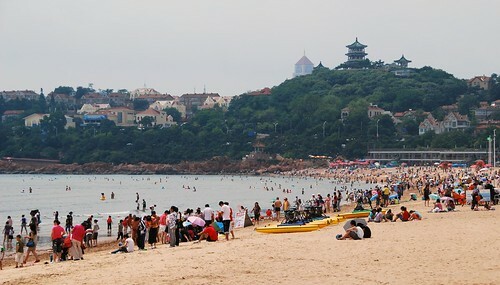 Both German architecture and Chinese people on the beach are novel sights in China, which makes Qingdao a rare place indeed. But the brewery! Totally worth it, even though they were stingy with the free samples (a mere half pint!). The majority of the self-guided tour is pretty standard fare: the history of Tsingtao, different advertising campaigns, bla bla. What made the tour interesting is the actual, functioning bottling plant. 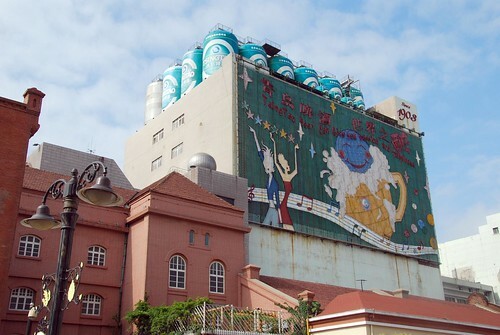 I swear Jeremy and I stayed there for half an hour watching them bottle and can the Tsingtao brew. We’re nerds like that. 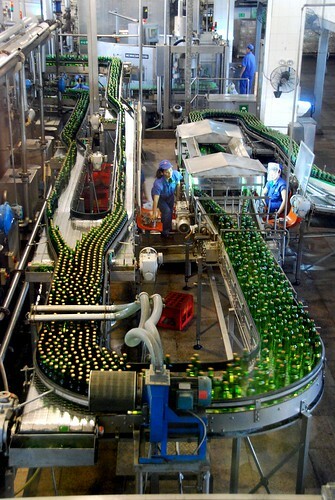 The Tsingtao bottling plant in action. 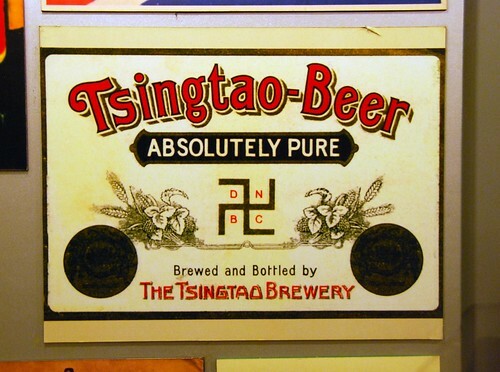 The other highlight of the Tsingtao brewery tour was the Drunk Room. Basically, it was a room where the floor was slanted. Simple but surprisingly effective! We totally felt drunk (it was BEFORE the tasting room, I swear)! Me in the Drunk Room at the Tsingtao brewery. I can’t say we loved our time in Qingdao…the city itself is really spread out, and beyond the brewery there isn’t much to do besides wander around the parks (which, I have to admit, are pretty nice), or try to find some German food to eat (surprisingly difficult in Qingdao! We only know of one place: Monnemer Eck, which is was dead empty when we dined there. Good food though!). But there is one reason why this Chinese city will always stick out in my mind: I had a total meltdown trying to leave Qingdao. Are you ready for this? We decided on our next destination (Taishan), and learned that there was both a bus and a train that could get us there. The express train left at 6AM, but only took 3 hours. The bus took 6 hours, left several times a day, and was cheaper than the train ticket. So J and I decided on the bus. Only thing is, NOBODY seemed to have any idea what time the bus left. There was no telephone number you could call, no schedule, and the bus station was about 15km north of the city center, so it wasn’t really convenient for us to hop over and ask. Whatever, we’ll just show up at the bus station the next morning, right? By the time I get to the front of the line, train tickets are sold out. Great! Back to the bus we go. Over at the bus station, the saleslady tells me that tickets for the 12:30PM bus are sold out; next bus is at 3PM. Double great! We have little choice at this point but to wait 4 hours for the next bus. At least there were funny Chinglish signs there to keep us amused. Is this where Chinese people go to stare at the tourists? At around 2:30PM, I start gathering my things. But hold on a minute…something seems fishy. Why isn’t there a bus at our gate? I examine the ticket (which is all in Chinese), I see the numbers “12:30,” and I start to panic. Did our bus leave at 12:30? Why did the woman at the window tell me 3PM?!? It is possible I misunderstood, but the words for “3:00″ and “12:30″ sound REALLY different in Chinese. So i run up to the information desk, frantic. Hope: Can you tell me if this ticket is for the 12:30 bus to Taishan? The woman at the window told me it was a 3PM bus! Information Lady: We don’t have a bus at 3PM to Taishan. This bus left two hours ago. H: But…but…the woman told me 3PM! IL: Didn’t you hear them announce that your bus was leaving? H: I wasn’t listening! I’m not from here! IL: Well, there are no more buses, you have to leave in the morning. H: [Almost in tears at this point, and not being coherent] I’m not from here! *In retrospect, it was almost unbelievable that she so readily gave us a refund. But I was too distraught to recognize this at the time. I can’t tell you why I wigged out so badly…the back-and-forth from the bus station to the train station and back again definitely kicked it off, but I think the bulk of it had to do with my growing suspicion that being a Chinese American traveling in China was not an asset, but in some ways a burden. Sure, there are times when it has been awfully convenient to be able to communicate. But there are other times I feel it is easier to have Jeremy’s face in China than my own. I couldn’t shake the feeling that this misunderstanding NEVER would have happened if Jeremy and I were two Western-looking people…they would have tried to find someone who spoke English, or they would have pointed out the time on the ticket. And maybe that’s why I melted down—because the country to which I have attached my ethnic identity wants almost nothing to do with me. Nobody is trying to take their picture with me (whereas Jeremy’s face must be imprinted on hundreds of memory cards and hard drives around the country). Nobody wants to help me—in fact, sometimes they laugh in my face when I make a “weird” request (like, “can you put some vegetables in my soup?”—what a FREAK!) Or if I don’t understand the phrase they used, they talk about me like I’m not in the room, as if all of a sudden can’t understand anything they are saying. Heck, we even got scammed by my “people.” Do you think a Chinese person would laugh in Jeremy’s face if he mispronounced a word in Mandarin? Doubt it. They’d probably be too busy falling over themselves with adoration. 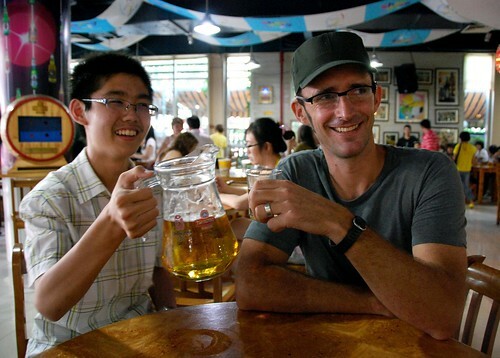 Jeremy posing with yet another unidentified Chinese boy at the Tsingtao brewery. As a Chinese girl growing up in the USA, I spoke Mandarin at home, went to Chinese school on the weekends, and ate hot pot on Thanksgiving. I thought I was Chinese. Only now, after traveling through the countries of my ancestors, do I find that the truth is much more complicated than that. I find myself grossed out by all the spitting, annoyed with the crowds, irritated by the constant noise, disgusted by the bathrooms…and yet simultaneously, I want to defend this country to the Westerners who complain about the exact same things. I want to explain that Chinese people spit on the floor because they think blowing your nose in a tissue is disgusting. I want to challenge them to live in a country with 1.3 billion people and see what their public bathrooms look like. I want to tell them: just because it’s different doesn’t mean it’s bad. Oh, the confidence that is inspired by that singular viewpoint! : To always look from west to east and not back in the other direction. Don’t get me wrong—there are many, many gifts that I was bestowed because of my ethnic heritage: a multilingual tongue, respect for my elders, a hair-free body. But that confidence is not one of them. I can still remember the first time I heard of the Army of Terra Cotta Warriors: it was in one of my Dad’s 1980’s-era issue of National Geographic. The image of all those soldiers, each one with his own unique facial hair, clothing, and even shoe tread, stayed with me through the years, so I was understandably excited to see the real deal. The Army is located a few kilometers outside of Xian (sometimes spelled Xi’an), easily reachable by cheap public transport. The complex consists of 3 different pits, with the most extensive excavation in the cavernous pit 1. 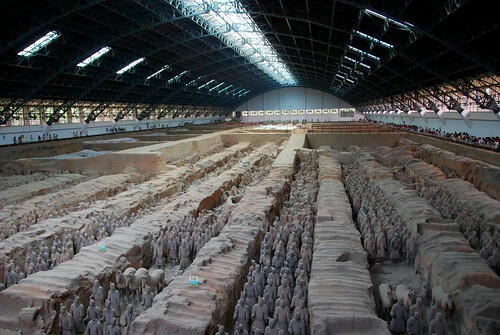 Pit 1, the largest excavation site of the Army of Terra Cotta Warriors. In pits 2 and 3, you can see excavation work still underway. 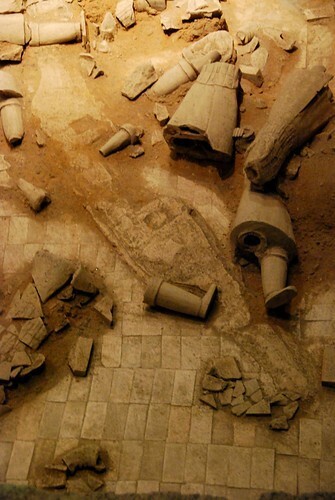 You can also see where the tomb ceiling has collapsed in parts, crushing some of the figures beneath it. Nobody knows why the Army of Terra Cotta Warriors exists, and there is something mysterious about the place, especially in pits 2 and 3, where the dim mood lighting adds to the mystery. I mean, why would someone create 8,000 different soldiers and bury them in an underground tomb? Unfortunately, seeing the real deal is probably not much better than watching a really good documentary on the subject. Part of the problem is that you can’t get very close to the soldiers in their natural habitat. Also, the grounds and buildings that the pits are housed in are super modern and, quite frankly, kind of generic and stale…they don’t really match the uniqueness of the site or of the soldiers—you almost forget that you’re at an active excavation site at all! 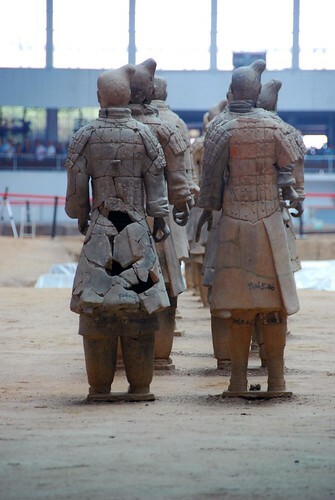 That being said, seeing the soldiers wasn’t a disappointment either…but some famous sites leave you so thrilled that you’d happily revisit in the future, and let’s just say that we’re happy to have seen the Terra Cotta Soldiers once in our lives but we probably don’t need to go again. 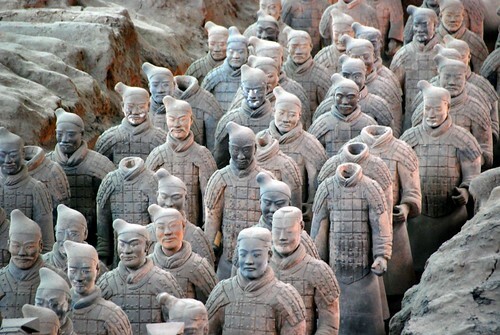 Most people spend a day or two in Xian, see the Terra Cotta Soldiers, and move on. 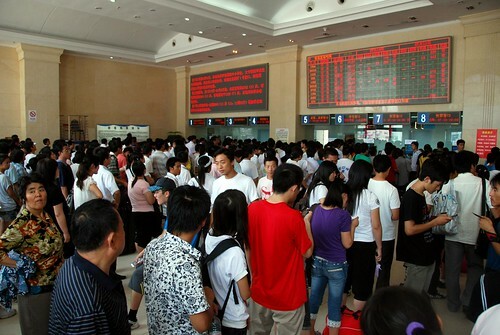 We actually ended up getting stuck in Xian—we were right in the middle of tourist high season (in a year when the Chinese government gave out travel vouchers for domestic tourism), and all the onward train tickets to popular destinations were sold out. So, we spent a good number of days exploring Xian, and despite the fact that it was brutally hot, we had a nice time checking out this interesting town. Locals hiding from the sun in front of the train station. Xian has a large Muslim population, and we were staying right in the midst of the Muslim quarter. We wiled away many an hour (when it wasn’t too hot) wandering around the neighborhood, taking in the local flavor. The Great Mosque, in the center of the Muslim quarter, was fascinating, and we happened to be there during the call to prayer. 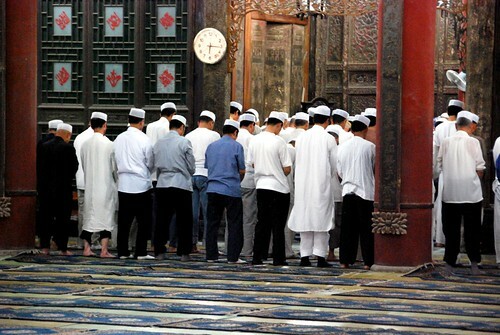 Prayer at the Great Mosque in Xian. A shoe convention during prayer time at the Great Mosque. 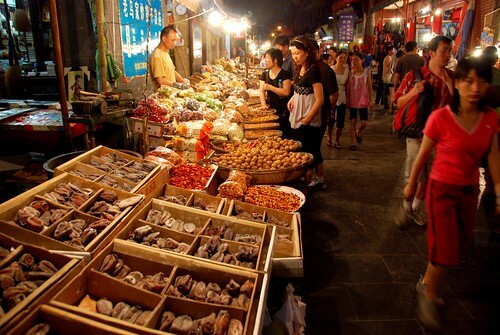 At night, the neighborhood turns into a bustling market with lots of food stalls. We tried a local specialty called pao mo, which is basically a lamb stew with little bits of shredded bread soaked in the soup. It was delicious, but some of the other Chinese Muslim food we tried was very heavily spiced and it did not agree with Jeremy at all. We ended up spending the rest of our meals trying to find more conventional Chinese fare, which was quite difficult in the Muslim quarter. At one point, we were so desperate that we ate at Subway (though, to our credit, we did pass up Pizza Hut)! I have never seen Jeremy so excited for a 6 inch sub. 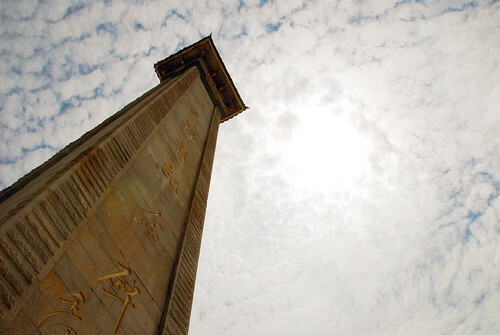 Xian actually has a bunch of stuff that would interest a tourist: the Bell Tower, Drum Tower, Big Goose Pagoda, and the Old City Wall, just to name a few. 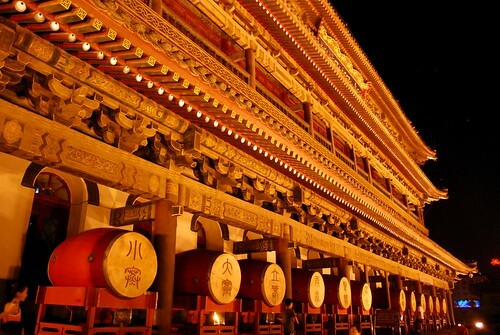 Xian’s Drum Tower at night. Unfortunately, it was so incredibly hot while we were there that we spent most of our days waking up early, going out for a few hours until we couldn’t stand it anymore, then hiding in our hotel until the sun went down and the temperatures became bearable again. 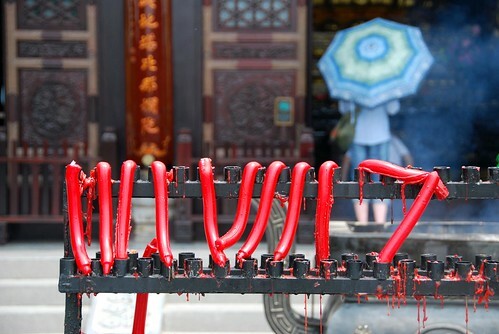 This is how hot it was in Xian. Hey, at least we figured out what our upper temperature threshold is: about 99°F with about 75% humidity. Ouch. NOTE: We’re switching things up a bit on the picture front! Since you probably don’t want to wait so long to see our photos, and you probably don’t want to see all 5 gajillion photos we’ve taken in a country at the very end, we’ll be adding Flickr slideshows for certain individual destinations! We’ll only do this for select destinations, just to keep you on your toes. As I mentioned in my previous post about Chongqing, we came here for the boat trip, but we stayed here for the people…my aunt’s peoples, that is. Not only were we set up at my aunt’s sweet apartment (she is currently living in the States with my uncle), but she had at least 3 sets of friends/family watching out for us, taking us out to dinner, paying for everything (as is the Chinese custom) despite numerous protests, and generally bending over backwards to make sure we were comfortable and having a good time. And here we thought our five-star days in China were over once my parents left! Jeremy and I have been amazed time and time again on this trip by (1) the number of extended friends and family we have around this world…who knew?!? We sure didn’t!, and (2) the generosity we’ve been shown by people who have only the most tangential connection to us (In fact, I’ve only met my aunt twice! She only recently married my uncle). Note to selves: become better hosts when people come visit San Francisco. We have some serious karma to pay back. Thank you, World, for taking such good care of us. View from my aunt’s apartment of the Jialing River. Same view at night. Chongqing is really spectacular once the sun goes down…you can’t see the smog and the lights along the river are sensational. When my aunt’s friends Huang He and Jiang Su came to pick us up at the train station, I figured we’d go out to dinner once, and maybe get a few tips from them on what to do around Chongqing. We quickly came to find out that between Huang He, Jiang Su, and a few other friends/family (Qing Hong and Wan Jian), we had activities planned for each day, we would be treated to dinner every night, and our plans for the Three Gorges Yangzi River cruise would be taken care of for us. Apparently, it takes a village to care for 12FOOT3! 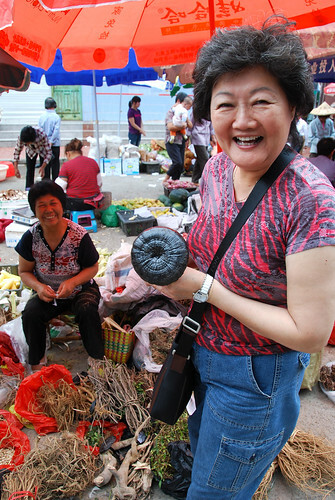 We spent a couple of days under the care of Qing Hong, who coordinated a driver to take us to Ciqikou, a preserved and restored village with a main drag set up with shops and food stalls for tourists. We were there on “Kid’s Day,” (an national holiday in China), and there were tons of adorable tykes wandering around, reveling in their special day. Baolun Si is the only remaining temple in Ciqikou, and we stopped by to pay our respects and light some incense for our ancestors. 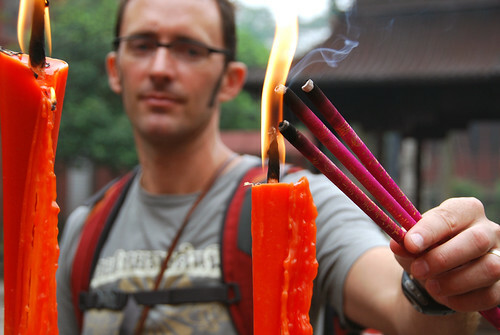 Jeremy lighting a candle at Baolun Si in Ciqikou. For a tourist village, Ciqikou is pretty amusing…we enjoyed ourselves as we walked the main drag, gawking at all the specialty food (rice steamed inside a bamboo pole, cotton candy in the shape of a flower) and random carnival games (sweet little Chinese teenage girls shooting rifles at balloons, little kids riding mechanical elephants). The nicest part of the town, however, is the quiet back streets, where people actually live and Ciqikou is still a functioning village. The following day, we were accompanied by Wan Jian (my aunt’s younger brother), who started off the day by taking us to Chongqing’s “Good Eating Street,” (Hao Chi Jie) a small pedestrian street full of local food stalls. Chongqing is most famous for one flavor: spicy! In fact, their version of spicy is called ma la, or “numbingly spicy.” Interestingly, it is not the chili that makes your tongue numb, but the addition of this small round spice that looks almost like a peppercorn. We weren’t crazy about the feeling…imagine eating a bowl full of spicy noodles after your dentist injected your with a local anesthetic. That’s pretty much what eating a bowl full of ma la noodles feels like…which is not to say the noodles weren’t good, or even spicy, it’s just…weird. Wang Jian was really eager to feed us, and he ran around the food court area collecting different snacks for us to try. At some point, he came back with three skewers, which he told us were duck intestines, duck tongue, and duck heart. Awesome! 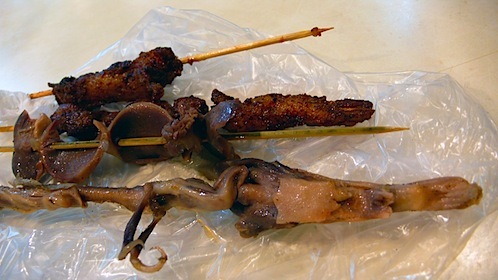 Just what I was craving…some good ol’ roasted duck parts on a stick. This is duck tongue. On a stick. The duck intestine and duck heart were fine, as long as you didn’t think of what you were eating. But the duck tongue. Oh man, I just…Could. Not. Do. It. The texture was waaay too much for me. I told Jeremy, “I feel like I’m frenching a duck!” But given that Wan Jian was so excited about showing us his hometown’s food, we couldn’t just leave the tongues sitting there. So Jeremy took it for the team and nibbled down a few tongues while I stuck to the hearts. 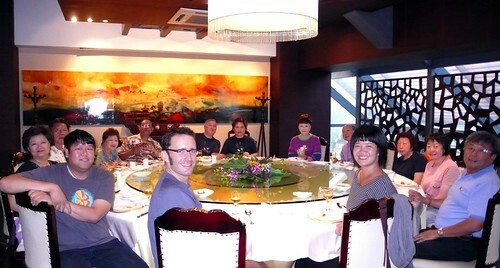 That night, Huang He and Jiang Su treated us to dinner. They knew that we wouldn’t be able to handle truly spicy Chongqing food, so they looked for a restaurant that specialized in more mild fare. Jiang Su asked me if we ate ge zi, and I was like, “sure!” I had heard that word before, but I couldn’t remember what it was…so I pulled out my handy iPod Chinese dictionary, typed in the pinyin, and what do you know, ge zi means “pidgeon or dove.” I’m sitting there in the back of the car on the way to the restaurant thinking, “please let it be dove, please let it be dove…please don’t tell me we’re about to eat some pidgeons…” And sure enough, the restaurant is decorated with white dove icons all over the walls and ceiling. So Jeremy and I have chosen to believe that we ate doves that day, and not the pidgeons that you see running around on the street in Chongqing. I feel like ge zi tonight! Ge zi is apparently a Chongqing specialty, and the people here think that it is particularly nutritious and good for your body. And I have to admit, it was good…it just sort of tasted like a cross between a duck and a chicken. Again, just forget for a moment what you’re eating…or try to think of it as doves instead of pidgeons. To complete the trio of scary meals we had in Chongqing, Qing Hong and a bunch of her friends invited us out to hotpot the following night. 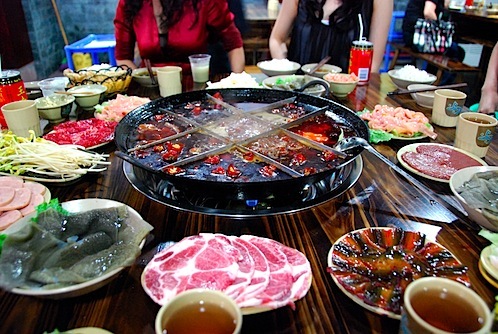 As you can imagine, Chongqing puts the “hot” in “hotpot.” As soon as you walk in the door, the hotpot is an assault on the senses. You can smell the spice. You can feel the spice (it starts stinging your eyes). And you can see the spice (an enormous, boiling vat of liquified peppers). In spite our wussy American tongues, Jeremy and I put in a pretty good performance at this dinner. We ate almost everything that was put in front of us, without even “washing” the boiled meats in water (as Qing Hong and her friends suggested we do if the food was too spicy). I have to say, this was no small feat for us, especially since about 90% of the stuff they put into the hotpot was intestinal in nature. 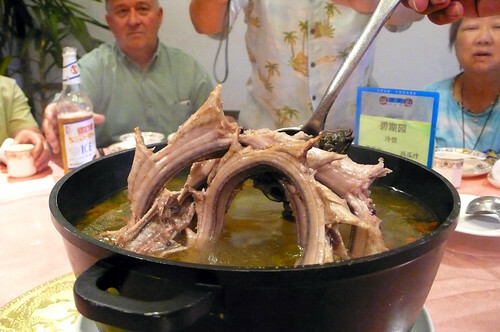 I’m used to eating hotpot with sliced pork, lamb, tofu, cabbage, and mushrooms. This was no soft, pansy hotpot like the stuff we eat at home…we’re talking liver and entrails and pig brains (yes, pig brains!!!) here. The scariest thing for me was the green, hairy cow stomach (you can see it in the photo above on the bottom left). Someone pass the heartburn meds. I have to admit, Chongqing was the one place so far on the trip that we were too scared to eat the street food (besides Chiang Mai, where we had issues). This had nothing to cleanliness, and everything to do with spiciness. Seriously, the people here eat stuff that would make most Americans’ heads explode. Despite all the scary food, we had a wonderful time in Chongqing. I feel like we really got a sense of the place and it’s people. Even though Chongqing is not really a tourist destination, it was super interesting to see all the development here and we had a wonderful time meeting all my aunt’s friends. Traveling around China can be really hard and stressful, and it was really nice to be taken care of and to feel like someone was watching your back. Jiang Su even took us to the ghetto pirated DVD store, where we got taken up into the hidden back room so we could check out the newest releases from the States. Now THAT’S what I call care! 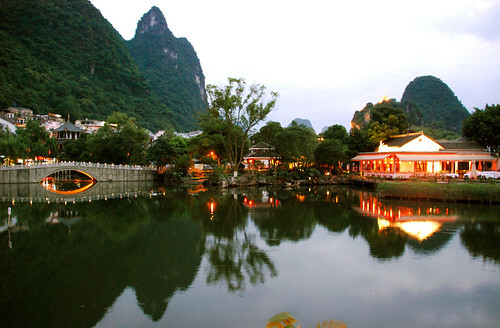 But seriously, at a time when I was still feeling disappointed at my peoples for our Yangshuo experience, I was reminded that the best parts of Chinese culture still persist. Chinese people will still display extreme levels of generosity, all the while making you feel like it is something they are happy to do. They still want to show you the wonder and beauty of their hometown (even if that beauty is in the form of a duck’s tongue or a pig’s brain). And they still bend over backwards to make two vouched-for strangers feel like they have a home away from home. 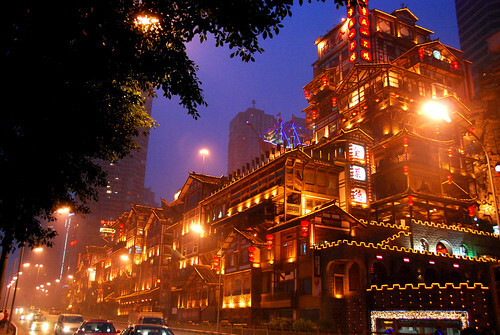 Hong Ya Dong, a restored “old Chongqing” housing complex, which is now a tourist shopping complex. Liberation Monument, the cultural center of Chongqing. 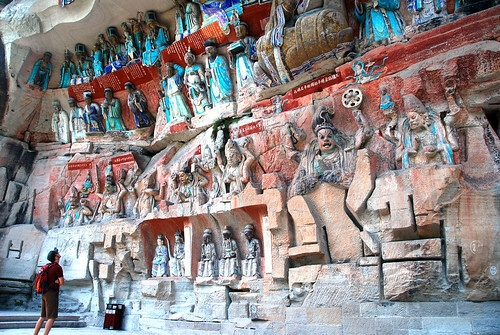 Dazu Caves, an 800+ year-old Buddhist sculpture grotto outside of Chongqing. See more of our photos of the Caves here. 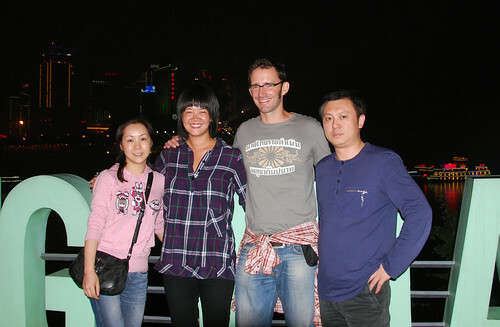 Jiang Su, me, J, and Huang He in front of the Yangtzi River. 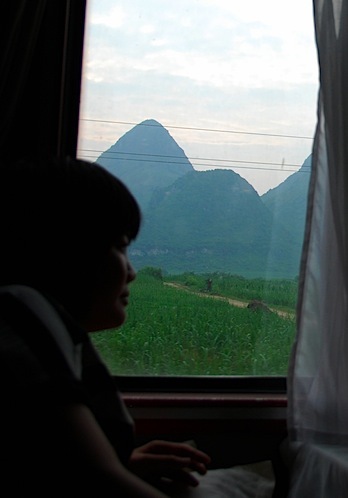 We hightailed it out of Yangshuo and jumped on the overnight train to Chongqing, in Western China. We got on the train at 1PM and arrived in Chongqing the next morning, so we had plenty of daylight hours to enjoy the view…and what a view it was! 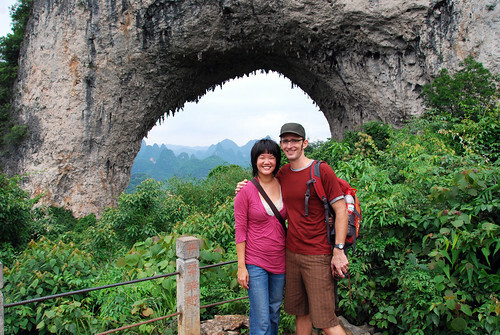 Guangxi province has an incredible landscape…full of the same karst formations we saw in Yangshuo. This was our first experience in China traveling “with the people,” and we saw many Chinese families en route to their various destinations. We shared our cabin with a man of 40 or so who was taking his ailing uncle to Chongqing for treatment. His tenderness towards his uncle (who he told me was “like a parent” to him) reminded me of the best aspects of Chinese culture (respect towards the elderly, filial piety, etc. 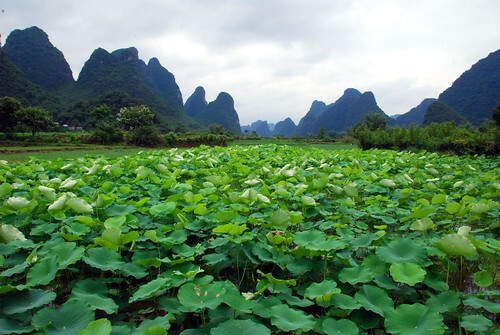 ), at a time when I was still stinging from experiencing its worst in Yangshuo. 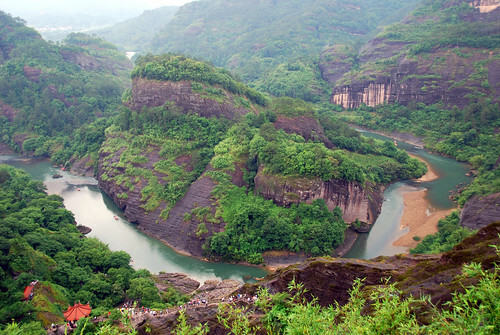 You’ve probably never heard of Chongqing, and it’s not on most travelers’ radars as a destination (other than as the launching point for boat trips down the Yangzi). Actually, we wouldn’t have considered Chongqing as a stop on our trip through China, except that my aunt (Xiao Jo Ma) has an apartment there, and she insisted that we take advantage of it. 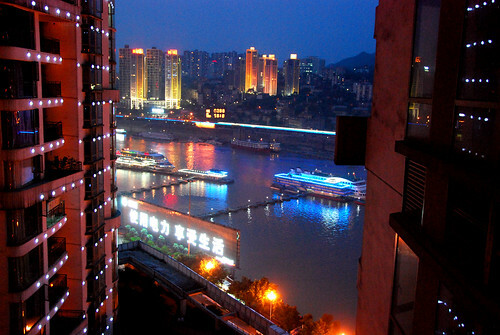 Chongqing’s Jiefangbei district, seen from across the Jialing River. 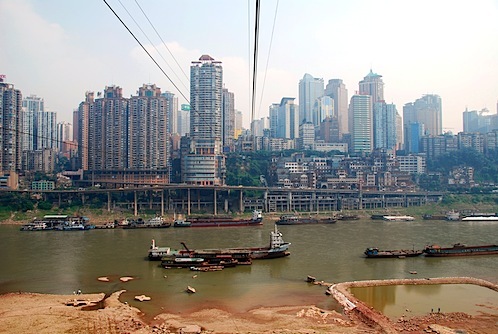 Chongqing is the fastest-growing city in the world, as rural populations flock to the city for job opportunities. Some estimates put the population at 40 million. Let that sink in for a minute: 40 MILLION. For reference, that is almost twice the number of people in the entire country of Australia. There are an estimated 1200 people moving to the city EACH DAY. A model of Chongqing in 2010. It is hard to capture the scale here, but for reference, there are two people standing in the upper right hand corner of the photo. 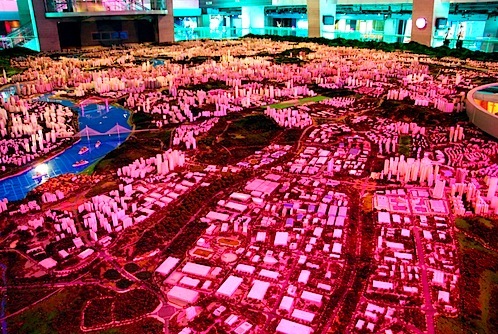 Chongqing’s urban planning museum is brand new and super slick, but we couldn’t help but notice that many of the interactive computer models were broken, and letters were already falling off the displays…a poetic metaphor for the future of Chongqing. 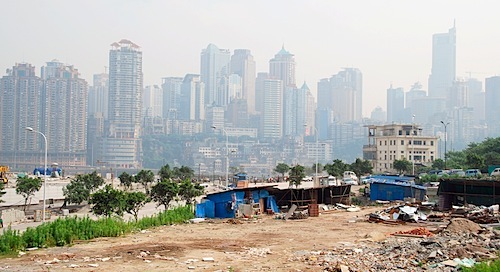 Indeed, it seems that Chongqing’s appetite for the new and bigger is insatiable…we noticed many recently-built buildings that were already starting to fall into disrepair: perhaps poorly and hastily-built, their decay advanced by neglect. The message seems to be: rather than maintain an old building, build a new one. 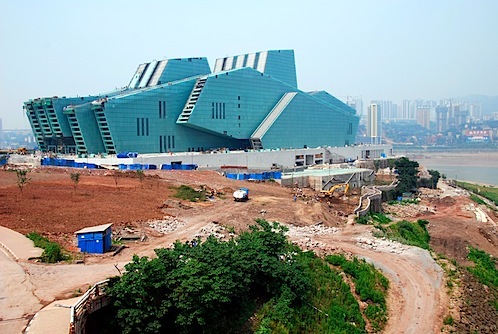 The enormous Opera House under construction in Chongqing. We think it looks like a tank. 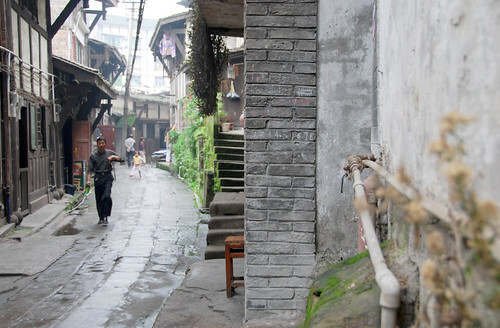 Chongqing is a fascinating mix between the old and the new China. 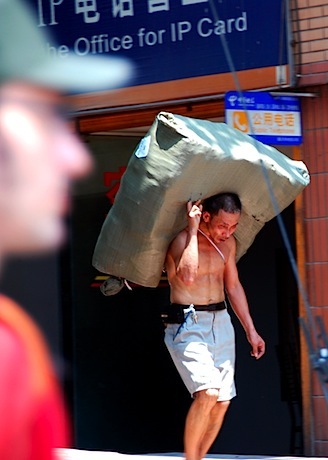 “Bang bang men” carry huge loads of goods on their backs up and down multi-level highrises. Former farmers sweep away construction debris with homemade bamboo brooms. 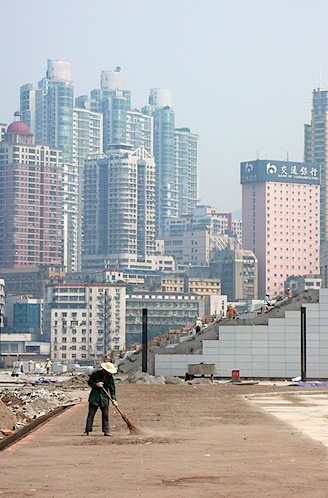 These scenes seem incongruous somehow with the rapid modernity that Chongqing is currently experiencing. Bang-bang man with a heavy load. Construction worker sweeping debris with a bamboo-stick broom. Of course, the price of all this “progress” is reflected in the environment. The air quality in Chongqing is absolutely horrible. We did not see the sun a single day we were here. 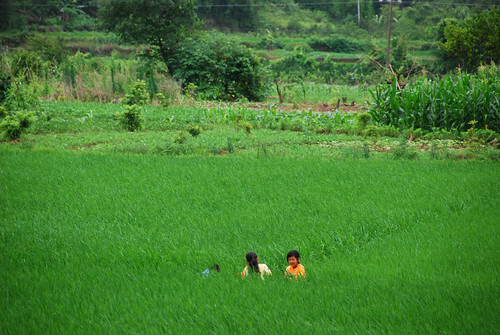 It is clear that the environment cannot continue to sustain this level of development. 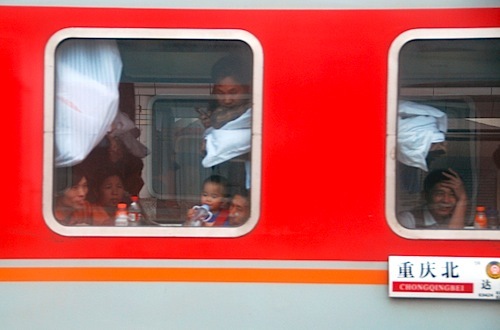 So this is what I mean when I say, “the China we are seeing now may never exist again.” With 1200 people moving into the city each day, rapidly leaving their old, rural lives behind…China is forging ahead and not looking back. I say this without nostalgia…there is little doubt that these peoples’ lives are improved economically and it is unfair to expect them to preserve some idealized way of life for a Western audience. But as the narrator in the video I linked to above asks, when you look at the effect that this development has on the earth, is this really progress? The final stop on our two-week trip through China with my parents was Xiamen, a city located on the southwest coast of Fujian province. 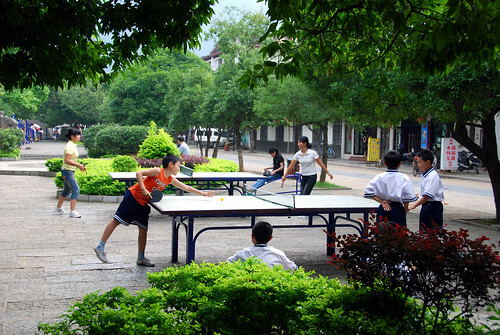 Xiamen is a city, but it’s very different from other Chinese cities. First of all, because Xiamen is coastal, the air quality is supposed to be quite good (though it was still pretty hazy when we were there). Second, the Chinese government has made the buses very cheap in order to encourage public transport, so there are hardly any motorcycles or bikes on the road. And finally, Xiamen is a mere 2 km away from Jinmen, a Taiwanese island (the one that was bombed throughout the 50s and 60s by the Chinese), so there is much trade and travel between the the two countries. 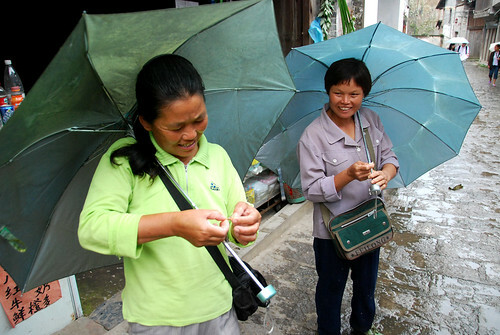 The people of Xiamen even speak the local Taiwanese dialect. All of this makes Xiamen feel almost like a generic big city in Taiwan, which (in general) was not really that interesting to us…but we did do a few things of note in the city proper. We checked out a memorial to a local merchant who made his fortune in Singapore and came back to his hometown of Xiamen in order to develop the city (many towns in China were developed in this way—through the benevolence of one of it’s people). Memorial to a man who helped build universities and other public institutions in Xiamen. And we visited the island of Gu Lang Yu, which is Xiamen’s main tourist attraction. I think all of us in the group were pretty tired at this point on the tour, so we didn’t explore too much of the island. Given more time and energy, I am sure it would have been interesting—Gu Lang Yu has an international past, with many ex-pats living on the island. Today, it is known as “Embassy Island,” with something like 100 foreign embassies squeezed onto it’s tiny body. By far the most interesting part of our time in Xiamen was actually our visit to a place about 3 hours outside of the city, a place called Hakka House. The Hakka are an ethnic minority in the region that live in huge, communal, circular houses made out of mud, sticky rice, and stones. 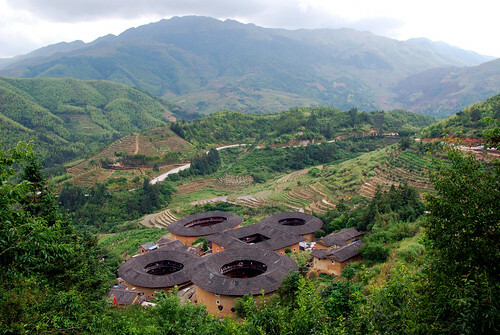 View of Hakka House from above. View of Hakka House from the inside. 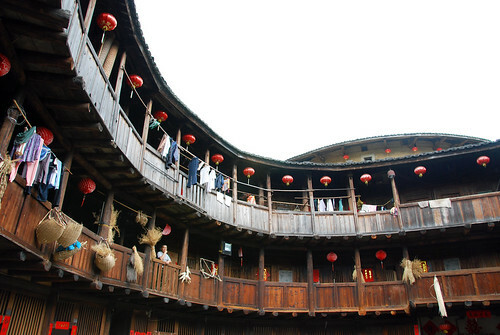 Hakka houses are are built in a circular shape for protection from local bandits and animals. They are really big, but they house only one family…though “one family” can mean up to 4 generations of grandparents, parents, kids, uncles, cousins, etc. 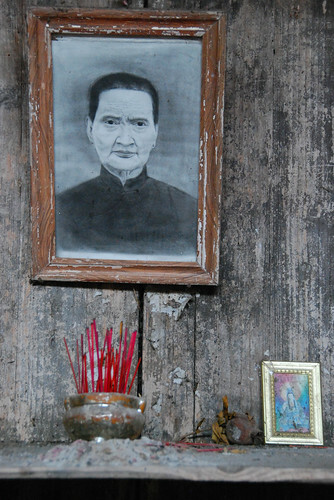 The first floor of a Hakka house is all kitchens, with storage on the second floor, and living quarters on the top floor. It can take years to build a Hakka house, since they are made of mud and sticky rice…you have to wait for the first floor to dry before building the next floor. Little girl getting her hair washed by her grandmother. She was screaming and carrying on as her grandma tried to comb the tangles out of her hair. 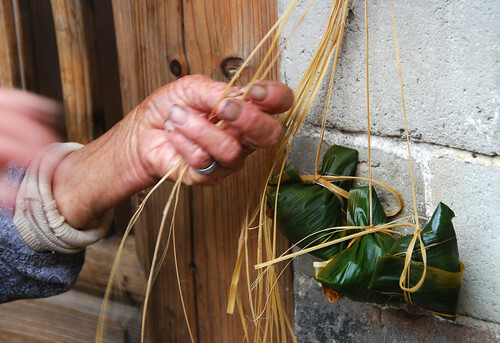 Woman with amazing hands wrapping zong zi. My mom with some sort of mushroom. 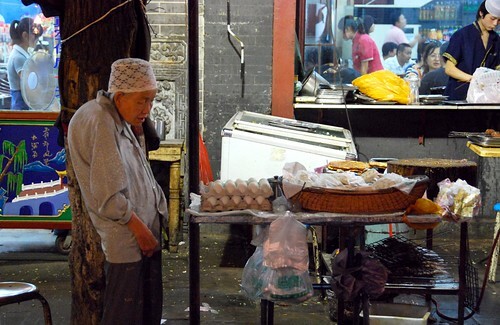 I don’t know why, but I LOVE this photo of an old lady in the market. I really enjoyed our time at Hakka House and this local village, but our visit was far too short. Because it was a 3 hour drive from Xiamen each way, we had to hurry back for our special goodbye dinner, where we played a Xiamen dice game and ate something called “sea worm.” I have to admit, it was fun to do this eating tour with Frank, but I am not sure how much more crazy stuff we could have eaten! In Xiamen, we said goodbye to my parents as we prepared to head our separate ways (us to Yangshuo, and my parents back to Taiwan via Jinmen). We had an incredible time traveling together with Eddo as a family, and it was truly a special experience to be with my mom on her first visit to China and with my Dad on his first visit back to Taiwan in 26 years. I feel that through this trip, I understand so much more about my parents than I did before. As I told Jeremy, “In the US, I feel like my parents are so Chinese. In Taiwan, I felt like they were Americans, and in China, I feel like they are Taiwanese!” The truth is, they are all three of those things, as am I, as is my brother. 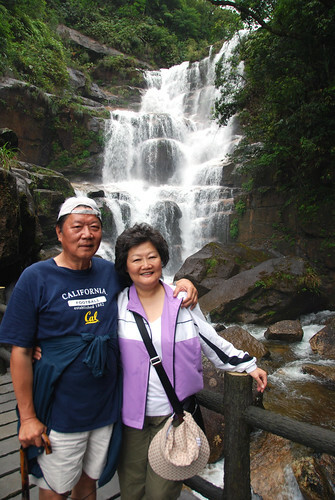 I see my parents in a new light now…I never thought of them as “international” before, but traveling through Asia with them, I see that they really are the embodiment of that word. I learned so much more about my heritage and I understand more deeply my responsibility to transmit the lessons I’ve learned from my parents and my grandparents to the next generation. In an email, my parents described this leg of our journey as “the trip of a lifetime.” Indeed, it was a trip of many lifetimes, and of many lives convening to lead us to this place, together, as a family. Thank you, Mommy, Daddy, and Eddo for coming out to travel with us, sharing your stories, and discovering this land that is both familiar and unfamiliar to us all. We will treasure this time together for many more lifetimes to come. After saying goodbye to Eddo in Shanghai, we headed off to Wuyi Shan (Wuyi Mountain), in Fujian province. Our introduction to Wuyi Shan was kicked off quite ceremoniously by The Scariest Dinner We’ve Had So Far. 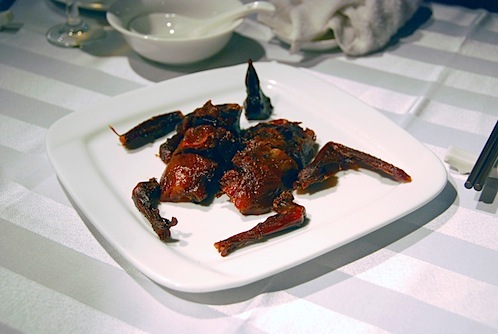 We were taken to a restaurant specializing in “local delicacies”, if by “local” you mean “scary” and by “delicacies” you mean “all breed of mountain animals.” We ate wild boar and snake and mountain toad and turtle and wild pheasant and and…the list goes on. By the end of the meal we didn’t know if we should be more scared of what dish was coming next or of ourselves! This is what snake soup looks like. After sleeping off our scary meal, we started the next day off with a ride on a bamboo raft. Our bamboo raft man told us many, many jokes in Chinese (of which I understood exactly NONE). My parents had a good time, though, so that’s all that matters. 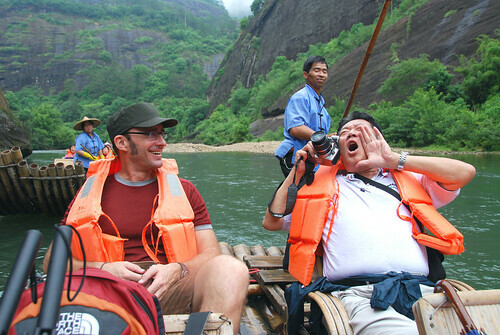 Of course, Bamboo Raft Man is no match for my Dad when it comes to getting attention…as we passed through a narrow channel, my Pops made like Tarzan and howled mightily, his voice bouncing off the rocks from one end of the river to the other. Um, is this REALLY my father-in-law?!? As you’re floating down the river, you can see a bunch of people climbing the mountain; they look like little ants scrambling up the steep rock face. Later on that afternoon, we did a little role reversal and WE were those little ants on the mountainside! The view from up top is stupendous, and despite the super steep climb on slippery wet rock, we all made it to the top! I was extra proud of my mom for pushing hard to make it up the mountain! The following day, we did some more hiking near the Blue Dragon Waterfall area, which was also quite pretty. But to me, the most interesting part of the Wuyi Shan area was the little run-down village (Xiamei) that the rest of the tour group wasn’t interested in at all. In fact, only my family walked through the entire village—the rest of the tour group turned around halfway through and waited on the bus. I guess they thought it was TOO run down and dirty, but I felt it was refreshing to see a place that wasn’t cleaned up and commercialized and polished for the tourist market. The main drag in the village was filled with old ladies sorting tea leaves. 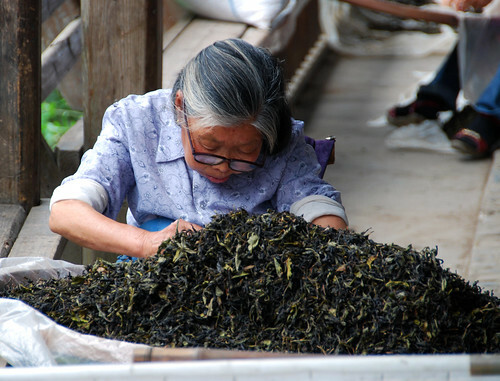 Tea is a big cash crop for rural China, so cultivating tea is one of the major ways you can make a livable wage outside of the cities. Apparently tea sorters get paid for the number of bad leaves they pick out of the batch (not the number of good leaves they leave in!). I liked observing the people—young and old—who lived in this town, and wondering what their lives were like: what makes them laugh? Where do they brush their teeth? What do they want to be when they grow up? Silly yet intimate questions, I guess. 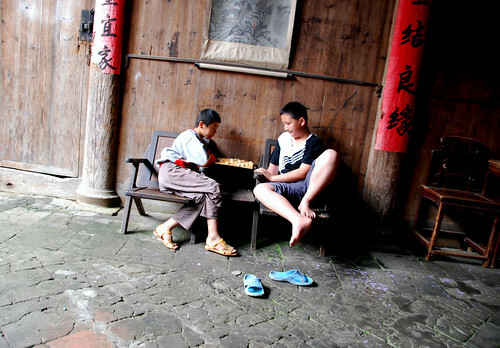 Two boys playing Chinese checkers. 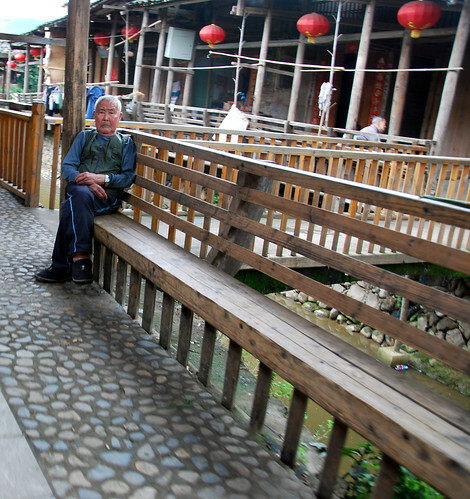 Old man on the main drag in Xiamei village. Xiamei seems a world apart from places like Shanghai. It makes you wonder…as the government puts more and more effort into improving (economically) the lives of its poorer rural residents, how long before the people of Xiamei decide to move to the cities, where they can make more money hauling loads of laundry up a multi-story building than they can sorting tea leaves? How much longer before places like Xiamei are simply a relic? Our looooong day in Hangzhou was followed by a much more leisurely morning exploring a floating village called Wu Zhen. The tour group arranged a boat trip through the village for us, which was quite picturesque and relaxing. As we floated down the canal, we saw many old homes that are still inhabited by families (as evidenced by their underwear and other laundry hanging out to dry—Chinese people are definitely not afraid of other people seeing their underthings). As it turns out, this picturesque little village has a sad story. Wu Zhen was turned into a tourist attraction by the Chinese government, and even though visitors must pay an entrance fee, the residents do not receive any payment for the inconvenience of having hundreds of tourists filtering through their hometown on a daily basis. 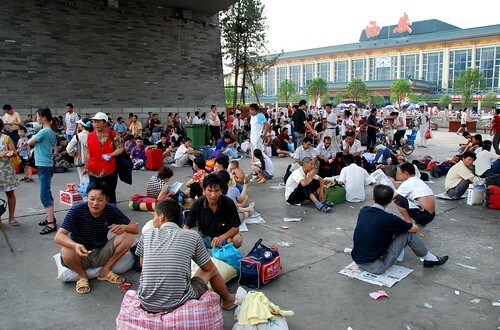 In fact, the people of Wu Zhen are not even allowed to vend until 4PM (when all the tour buses leave). I felt really bad for the village residents, because it was clear that their hometown had been turned into a zoo, and you could see in their faces that they were annoyed and frustrated by the constant stream of visitors coming to gawk at their “old” ways of living. As a result, I didn’t take too many photos here; I didn’t want to disturb these poor people anymore than we already were. Our tour guide explained that most of the young people had already moved out of the village; only the elderly (i.e., the people who could not afford to buy new homes) were still around. 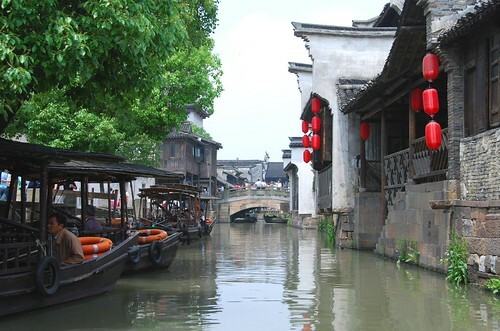 China’s incredible economic rise has brought a huge amount of prosperity to a huge amount of people, but the people of Wu Zhen have definitely been left out of that…unable to cash in on tourism even as their homes get turned into a modern-day Chinese Disneyland. 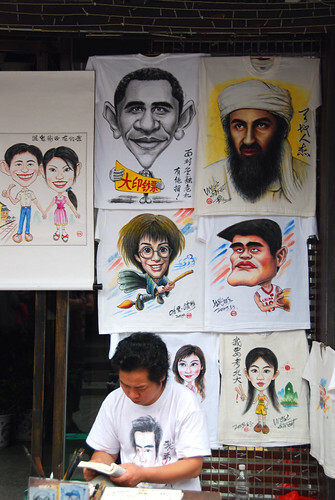 China, as we are finding out, is many things, but it is almost never solely what you see on the surface. Not only can you SEE a tour group coming from a mile away, but you can HEAR them too. 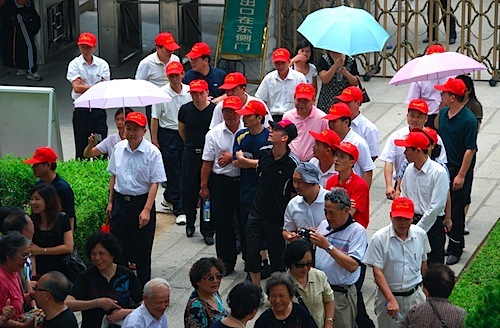 The matching hats are usually following a tour guide who carries a flag (usually yellow) and is screaming into a megaphone. You could be in the most serene, peaceful, natural setting, but the tour guide will be blabbering away on his/her megaphone. It’s almost like the Chinese feel they won’t get their money’s worth unless the tour guide is talking the entire time. Our Chinese tour guides made some slight changes to accommodate our “American” group: we didn’t get hats, for example. But they still talk an awful lot (sometimes they even sing for you)—they even talk when we are sitting on the bus, in transit from sight to sight. Luckily, most of what our Hangzhou tour guide had to say was quite interesting…we found out, for example, that men in Hangzhou area of China do all the housework, in addition to earning all the household’s money. This is very unusual in China, as the country is an extremely patriarchal society. On top of that, in order to attract a bride, the man must own a home, which can cost at least 1 million RMB in Hangzhou (about US$150,000). This is not a small amount of money in China, and usually the parents help their sons buy their first house so that they have a chance attracting a desirable wife. 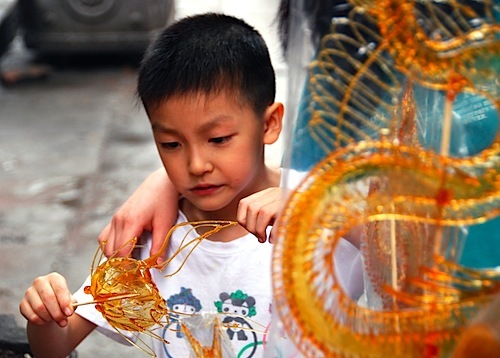 As a result, Hangzhou is the one area in China where having a daughter is more desirable than having a son. I am not really sure what women in Hangzhou do, since they don’t work and their husbands do all the cooking, cleaning, grocery shopping, and laundry. I guess they just shop all day? As you might imagine, Hangzhou men are extremely desirable husbands in China. The Garden to Linger In. View of Leifeng Pagoda in the background. 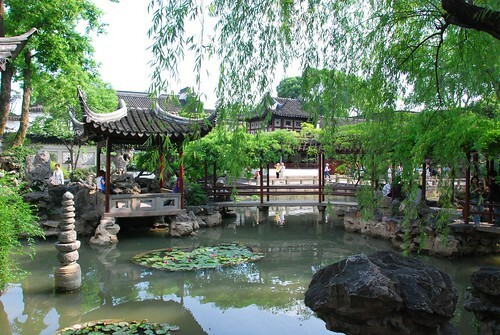 This is a feature of Suzhou gardens: incorporating background elements into the garden’s design. 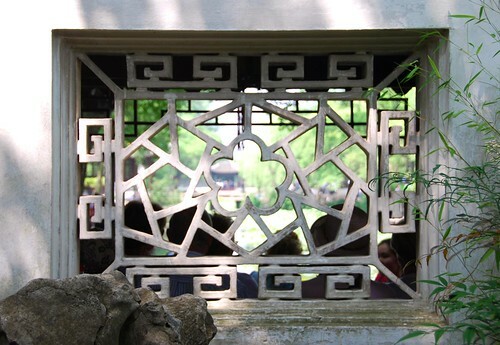 My two favorite things about Suzhou’s gardens were (1) the amazing windows…each one has a different pattern, and there are hundreds of them! 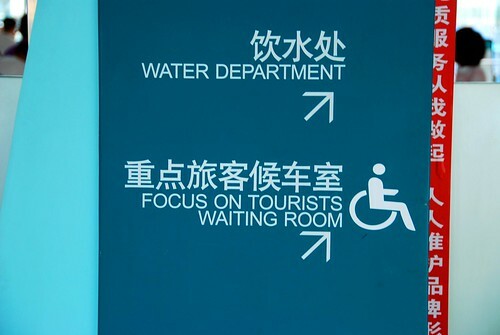 And (2) Suzhou’s amazing Chinglish signs! BTW, here’s a link to an amazing Chinglish brochure from our hotel…not to be missed! 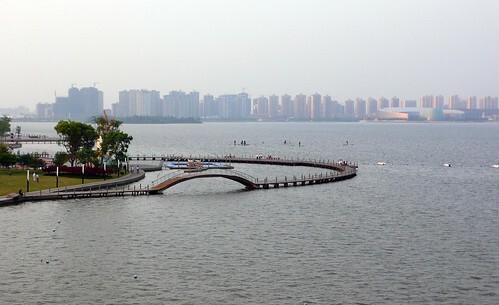 The restaurant overlooked a large lake, and we got to see the huge amount of redevelopment that has gone on in Suzhou. Apparently Suzhou is following in Shanghai’s footsteps and building a large number of high rises as the Chinese economy booms. 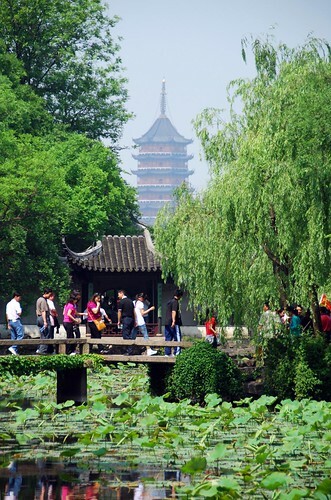 Frank told us that he felt Suzhou has lost its charm…and it’s hard to disagree. I mean, the gardens are still there (many of them are UNESCO World Heritage sights, so they are protected), but it’s hard to imagine how that ancient way of life is going to coexist with a population that has an ever-growing appetite for the new and shiny. And if the old way of life does persist, will it just be an act? 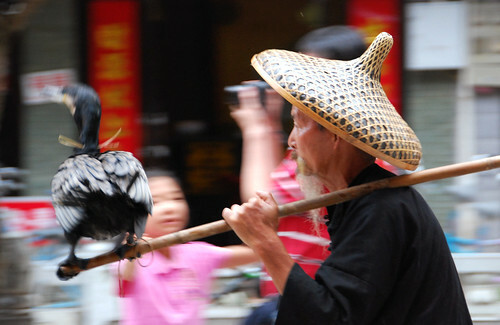 A show put on for tourists who want to come and visit “ancient” China? Once again, if you just look a little bit deeper, you can see all the issues that China has to grapple with as they move full-steam towards modernity. China is a fascinating place at a fascinating time in its history, and it’s easy to see that the journey ahead for this huge country will involve some difficult choices…many of which are being put off for the short-term pleasure of economic prosperity. Huangshan: Eddo Guest Blogs China! Note: Hey everyone, let’s give a warm welcome to Eddo! My little bro shares his thoughts as the family travels Huangshan…I love that even though this post is about a mountain, he manages to nerd out on urban planning. Kudos, Eddo! As an urban planning nerd/activist, I’ve always been interested in the growth and history of cities. Why did this particularly scenic peninsula morph into modern-day San Francisco? How did the end of the Mississippi River support a multi-ethnic creole population like New Orleans? How did two tiny islands in the middle of the Seine River become a focal point for a global city? How did civilization in the past evolve into its current form, and how do our actions today determine tomorrow’s society? Anyways, enough of this urban speculation—I promise I’ll get back to it later—let’s get to the heart of this entry. Huangshan (in English, “Yellow Mountain”) is located in the Anhui province of China, and is a major mountain range which has been opened up for tourism. 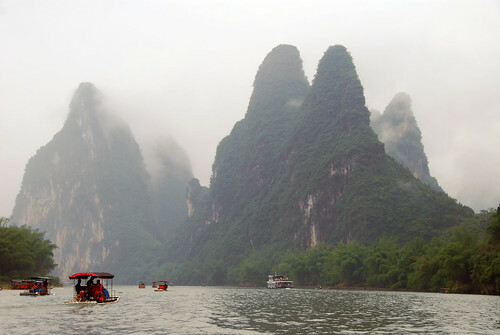 It has inspired countless Chinese poems, literature, and paintings, and deservedly so, because it is one of the most scenic and beautiful places I’ve ever personally experienced. Monkey Rock (the little rock perched on top of the huge stone on the left) overlooking the Valley. I’ve never been to China before, let alone Huangshan. The last time I was remotely close to China was probably when I was 6 or 7 years old, and was in Taiwan for my Da Jo Jo’s and Da Jo Ma’s wedding. I don’t really recall much from that time, except I liked riding on my youngest uncle’s motorcycle/scooter, and that it was really hot. So for me, Huangshan was not only an eye-opening experience, but also my introduction to China. China’s problems with rapid modernization and urbanization are well-documented, and I don’t think I need to go into too much detail, but to be introduced to China via its rural and agricultural communities, is, in a word, refreshing. We in America like to glorify a simpler time—when seasonality and locality weren’t just buzzwords for haute cuisine, when communities and societies flourished not because of economic indicators like GDP and inflation rates, but instead on the reliance of individuals in each community to provide a good or service necessary to its citizens. 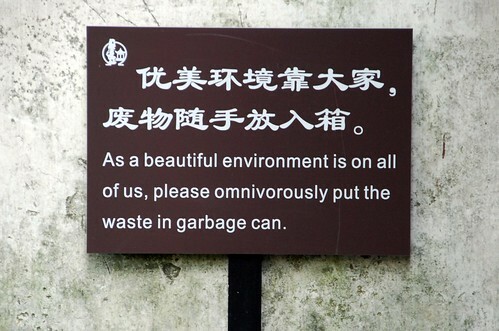 And this is what China is about, I think. Despite its rapid modernization, at the core of all production is people—roads are created by people moving around rocks in wheelbarrows, crops are planted by people leading water buffalo through a field. The concept of labor here is unlike America, where machines have taken over the most difficult of tasks. If there is a resource that China has utilized more so than any other country, it is its people. Performances like the Beijing Olympics Opening Ceremony requiring massive amounts of people, control, coordination, planning, and creative vision, could not have happened anywhere else in the world. Of course, this is both a positive and negative—things are built or created at a frenetic place, but the value of human labor is less than in other countries and services rendered by humans cost exponentially less than anywhere in the West. People are valued less as specialized individuals as they are cogs in a well-oiled economic machine. 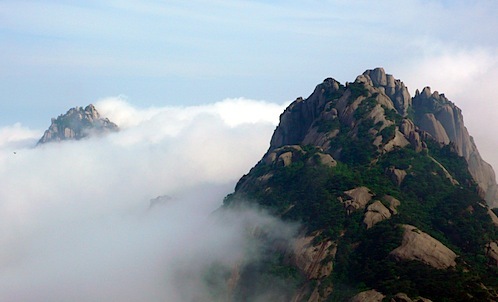 Huangshan’s famous “cloud ocean.” It literally moves in and out in minutes. Walking through Huangshan is a series of stone steps and pathways meandering along streams, cliffs, forests, and valleys. It is stunning. But you do get a sense of devaluation of individual labor. Couriers or porters carry up all goods that are used by the hotels at the top of the mountains (Ed. note: Indeed, supplies are not allowed to be hauled up the mountain on the gondola—even though it is surely cheaper to mechanize the delivery of these goods—in order to create jobs for local farmers who otherwise wouldn’t be able to earn a decent wage), luggage from tourists, and in some cases, people who cannot walk up or down the grueling paths of the mountain. It is incredible—I can’t imagine the amount energy or labor involved. 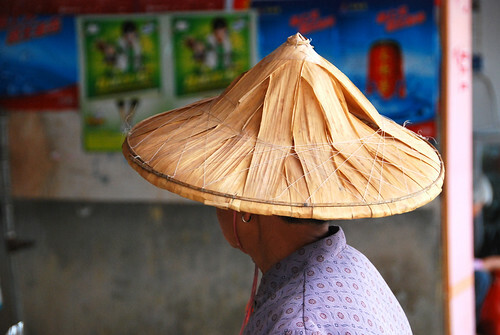 They get paid by the kilo, and generally balance inhuman amount of goods on a single bamboo stick on their back. Our tour guide told us that they can make up to 1,000 RMB a month (around US$150) which is actually a decent salary in their area. Individuals who work in the hotels on the top of the mountain stay up there for three months at a time, and get free room/board while earning salary. I don’t know how old the trails and steps of Huangshan are, but one does get a sense of how civilization and societies emerged in the olden days. Locations were picked based on geographic resources, and paths were then created to connect major population centers with each other. Much like cities in America developed along the Mississippi River from Chicago down to New Orleans due to geography and natural resources, I imagine this is how “cities” developed in Huangshan. 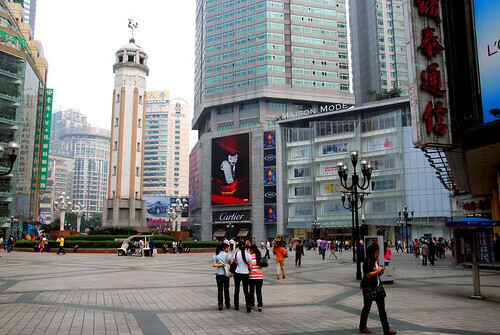 Except in Huangshan, these “cities” are essentially outdoor plazas with hotels and restaurants, instead of actual cities. 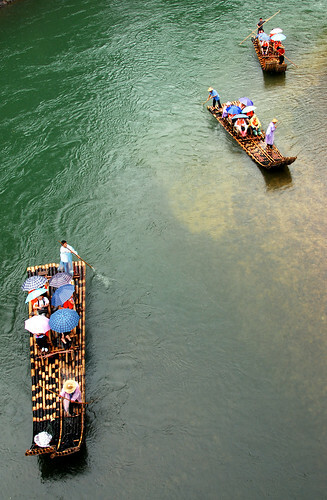 But these gathering places and webbed network of paths towards peaks and valleys and sights are in a sense, a microcosm of China, where cities are connected to each other by a network made up of boats, rail, roads, and planes rather than stone steps. Eddo hiking towards the giant golf ball (on the left, in the background), a weather station located at Huangshan’s highest point. Huangshan, much like the rest of China, encompasses a scale that I can barely comprehend. It is stunning. It is dramatic. It is imposing and it is spectacular. It is filled with jagged peaks, intense sunrises (which we woke at 4:30 for, climbed up a mountain and after concluding we wouldn’t see it, started hiking back down the mountain, only to see the sun peak through the trees, d’oh! ), and ancient trees and wildlife. 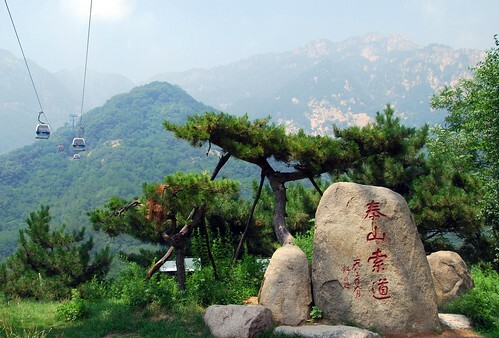 The Chinese have a saying that Huangshan is number one—after experiencing Huangshan, you need not experience any other mountains. My mother, who was also experiencing China for the very first time (she was born in Taiwan and because of China’s irregular rules on tourism during the Mao era, she hasn’t been able to visit until China became more open in the years after Mao’s death and China’s embrace of capitalism) celebrated her birthday on top of Huangshan. She said “I had always heard of Huangshan ever since I was a little girl but was never able to experience it firsthand until now. I cannot believe that I am celebrating my birthday here. 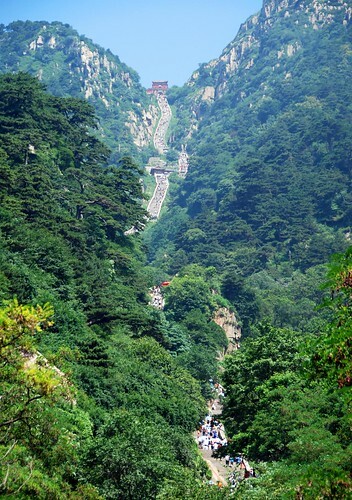 I am so happy.” I think we’d all agree—there is no experience like Huangshan in the world, and despite what you may think about China politically, Huangshan is not just a Chinese treasure, but a treasure for the world. P.S. Here is a link to Eddo’s photos of Huangshan on his Facebook.